Leslie Jenkins was born in Muswel Hill London. Leslie is married with three children and still lives in London today. 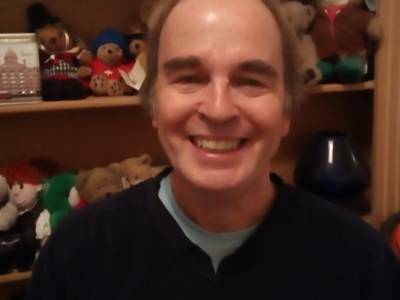 He is a qualified Private English TEFL Teacher and has been a professional clairvoyant for over forty years. He has been featured in Psychic News, the Local Press as a clairvoyant and consulted by celebrities and professional people. He is highly regarded and also trained as an actor with RADA and Sylvia young Theatre school but writing was his first love. Leslie has two cats, Martha and Peppa that inspired him to write his first astrology book “Astral Cats”, published by The Wolfenhowle Press. His first book was featured in “The lady Magazine, Yours Magazine, Woman’s World, Yours Magazine and Guardian Gazette” and was a great success. He has another book “Astral Dogs”, soon to be published. It was when he was on holiday in Portugal, on a coach excursion when there was a delay on the coach, he saw a Jacaranda trees and as the nearby voices left him on the coach, he heard “abracadabra jacaranda if you please”, and so Mrs Jacaranda was created. He plans to write further Mrs Jacaranda books dedicated to his three children. Leslie also plans to write a romantic novel, another astrology book and a detective novel. His interests include Travel, theatre, writing, astrology, teaching English and calligraphy.